Britain's Queen Elizabeth II looks on during a visit to the Science Museum on March 07, 2019 in London, England. Queen Elizabeth II visited the museum to announce its summer exhibition, 'Top Secret', and unveil a new space for supporters, to be known as the Smith Centre. 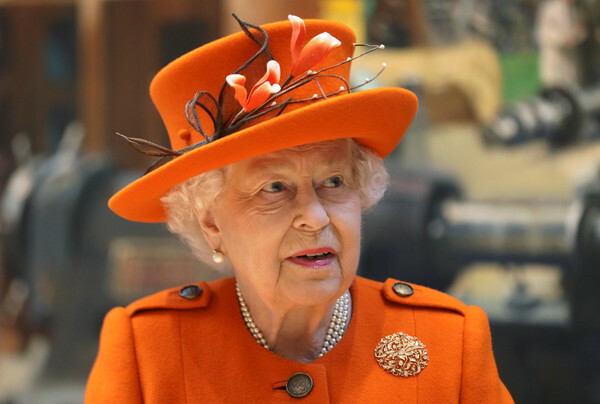 Queen Elizabeth II accessorized with a flower-accented orange hat to match her coat while visiting the Science Museum. Queen Elizabeth II decorated her coat with the Singapore Peranakan Diamond Jubilee brooch.